Karen’s national workshop, Connecting with Millennial Parents, now available for staff trainings at your school or local community. Has more and more of your job as a teacher or an administrator been devoted to meeting the needs of parents? Are you spending more time communicating and feeling less heard? Do you wonder if you can ever make the parents “happy”? New research describes a new generation of “Millennial Parents” who are changing the terms of effective communication. No need to bang your head against the wall any more – Discover the “AHA!” of connecting with Millennial Parents! In this seminar, we remove the frustration of “dealing with parents” and create a trusted and respected early childhood haven and resource for parents and families. 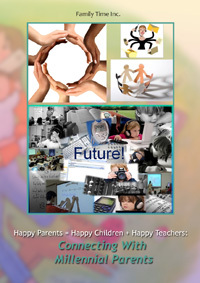 Discover why Happy Parents = Happy Children + Happy Teachers. Learn what it means to be a Millennial Parent and why Baby Boomers and Gen Xers have to think twice about being understood with a new generation of parents. Laugh and learn as we discover hidden assumptions in our parent communication. Parents are “supposed to _________” – fill in the blank with every frustrating miscommunication. Discover better ways to connect with Millennial Parents that will engage parents constructively in their children’s school and classroom. Take away tips and strategies that increase parent and teacher satisfaction. Celebrate transforming your program into a parent-friendly early childhood community! Participants will identify the changing needs of Millennial Parents. Participants will reformulate unrealistic expectations and sabotaging assumptions to form better partnerships with parents of children in their programs. Participants will be more effective and experience less frustration with parents when returning to their programs/schools. Teachers and administrators will create more successful educational teams, minimize professional burnout and increase staff retention when equipped with less frustrating parent communication tools.